Carl Zeiss Compact Primes were created in a response to the great increase in demand for cine primes that started in 2008. The concept was to produce a less expensive but still high quality prime lens set. 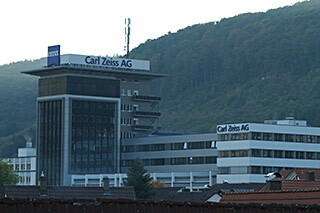 For several years Carl Zeiss had been designing high quality manual focus lenses for SLR cameras – the ZE and ZF series. These lenses were manufactured under contract by Cosina in Japan under Zeiss quality control. The Compact Prime concept was to take the SLR optics and put them in completely new mechanical housings made to professional cine standards. Another major change was that these would be the first cine lenses that would not be an ARRI/Zeiss branded product, but would only be Carl Zeiss branded and sold directly by Zeiss. Carl Zeiss contracted the optics manufacturing to Cosina, and the mechanical housings to a subcontractor (I believe that the mechanical housing manufacturing later moved in-house). Each component arrives at the Carl Zesis factory in Oberkochen Germany. Final assembly – mating of the optics to the housing, centering of optics, and laser engraving of the focus and iris scales is all done on the production floor at Zeiss. The process is streamlined to take up a minimum of time per lens from the highly trained Carl Zeiss lens production technicians. This is another factor in keeping the price low. The other cine lenses made on the same production line take much more time per lens, which is a factor in their higher cost. These new housings have an internal mechanical design that could be considered a lightweight analog of the Ultra Prime mechanics although they share no parts, other than the PL mount. Compact Primes use a main barrel that connects directly to the lens mount. Any force applied to the front ring (all except the 50mm Makro-Planar have 114mm diameter fronts) is transferred directly to the lens mount. This is unlike the older lenses, such as the standard primes or high speed primes, that used a telescoping helical thread system. The length of a compact prime does not change during focus. For the shorter focal lengths (Distagons), as with the Ultra Primes, only the rear group moves during focus. This helps control breathing during focus. Beginning with the 50mm they are unit focus, but with some modifications. The original Compact primes, which were only manufactured for a short time, were only offered in PL mount, and no other mount could be fitted. Each lens had a T-stop that corresponded to it’s wide open f-stop. So for the short-lived original CP set, the 50 and 85mm lenses were T1.5. The innovation that caused the explosion in the popularity of the Compact Primes was the interchangeable mount system introduced with the definitive Compact Prime 2 (CP.2) in early 2011. At the time (2010), the digital SLR cinematography revolution was taking place. The clear lines separating still photography and cinematography were blurred when Canon introduced the 5D Mk. II which was a full-frame professional quality DSLR that could shoot motion video. Many owners of these cameras wanted a prime lens set, but were torn between the need for Canon EF mount to fit their 5D Mk. II cameras, or PL mount in case a bigger budget shoot came up and they needed their lenses to work on a higher end digital cinema camera. This need was so great that there was a successful cottage industry for a while converting Canon 5D Mk.II DSLR cameras to PL mount. This was a permanent conversion that removed the flip-up reflex mirror rendering the camera’s viewing system useless. Yet this mod was very popular for a while. The CP.2 interchangeable mount system allowed you to have a lens set that could be switched between PL and Canon EF mount (originally). Later Nikon F and Micro Four Thirds mounts were offered. This interchangeable mount system required a modification to the main barrel of the original Compact Prime. Original CP’s can’t be fitted with the EF mounts unless the main barrel is modified which would require a complete overhaul. Check back focus, adjust shims if necessary (requires revering and repeating steps 2 and 3). Zeiss wisely switched from their previously used mount attachment screws – M2 screws with a 2.8mm wide slotted head – to Torx head screws. This is a very wise move. The old slotted screws had heads that damaged very easily. This was a problem for even experienced lens technicians. The Torx screws, combined with a Wiha torque limiting screwdriver, greatly reduced the potential for stripped screws. As they were designed as still camera lenses, all CP.2 lenses cover Full Frame 35mm except the 15mm T2.9. This is not the result of the 15mm optical design, but of mechanical vignetting caused by the front of the CP.2 housing. Some users had complained about the large differential in T-stops within the CP set, which ranged from T1.5 to T3.6. In order to produce a set with as large as possible a range with the same T-stop, the decision was made to limit the iris opening on the Planar 50 and 85mm to T2.1 This led to a set that matched the standard primes T2.1 aperture from 28mm to 85mm. One of the first new lenses to be added to the set is the CP.2 100mm/T2.1 Close Focus. It is based on the Makro-Planar 2/100 ZE-ZF lens. I consider it to be one of the best CP.2 lenses in terms of optical quality. At NAB 2012 the CP.2 15/T2.9 and 135/T2.1 were added. A new version of the CP.2 25mm was added to the set with a T2.1 aperture was introduced at IBC in September 2012, and the original CP.2 25mm/T2.9 was discontinued. The CP.2 set now ranged from 25 to 135mm at T2.1 with FF35 coverage. The CP.2 lenses were one of Carl Zeiss most popular cine product ever. In 2011 there was a 12 month wait to take delivery of a set. First shown at IBC in September 2012 were the CP.2 Super Speed series. With the introduction of the ZE-ZF Distagon 1.4/35, a set of three focal lengths of CP.2 lenses are offered with T1.5 aperture. These lenses are prominently labeled SUPER SPEED and are actually the first Zeiss lenses ever to officially have that name. The set is comprised of Distagon 35mm/ T1.5, Planar 50mm/T1.5 and Planar 85mm/T1.5. The 50 and 85mm Planar are not new designs, they simply revert to the original Compact Prime configuration of allowing the aperture to open fully. The image quality of the CP.2 lenses is quite good, especially considering their cost. They are derived for high quality still camera lenses, and their performance should be as good or better than the ZE/ZF lenses that they are based on. The wide angle CP.2 lenses perform particularly well in having low levels of geometric distortion. CP.2 lenses have a single centering adjustment that may not be present in the still camera version (I’ve never taken a ZE/ZF lens apart), so that could potentially mean better optical performance for the CP.2 version. Since all CP.2 lenses are designed to cover FF35 format. They have the advantage of being able to cover sensors larger than S35 format. But they also have the drawback that being designed for the larger format, they cannot deliver the MTF in the smaller S35 image area that a lens that was designed only for S35 can deliver (at least in the wider focal lengths). Compared to the higher-end Zeiss cine lenses, such as the Ultra Primes (which only cover S35 format), the CP.2 will generally not perform as well at full aperture. But most CP.2 focal lengths, when stopped down 2-3 stops from full aperture, are a fairly good match for the dedicated Zeiss cine lenses. The CP.2 Super Speed lenses should not be expected to perform as well at full aperture (T1.5) as the dedicated cine lenses offering that aperture (Zeiss High Speed and Master Prime series). They tend to perform more like good quality still camera portrait lenses, having some flare and spherical aberration at full aperture. These characteristics can be pleasing under some conditions, and the CP.2 Super Speed performance wide open can be somewhat similar to vintage lenses, although with significantly higher contrast. The CP.2 Super Speed will perform as well as the other CP.2 lenses once stopped down. CP.2 lens service follows a somewhat similar paradigm to Ultra Prime service. CP.2 lenses require some special service tools. Attempts at disassembly without the special tools (beyond lens mount swaps) can cause damage to the mechanics. The CP.2 mechanics are similar in concept to the Ultra Prime, but have a more lightweight construction (in keeping with the “compact” concept) coupled with a large diameter (114mm front instead of 95mm). This large diameter thin wall construction makes the CP.2 lenses sensitive to impacts. It is important to avoid impacts since in most cases the mechanical housing cannot be economically repaired. The most common procedure at Carl Zeiss Authorized Service Centers is to remove the optics from the impacted CP.2 lens and transfer them to a new housing. The cost of this repair is roughly half the cost of a new lens. CP.2 lenses tend to have a higher focus torque than Ultra Prime lenses and much higher torque than Master Primes or Master Anamorphics. The most common user complaint is high focus torque. Carl Zeiss introduced the successor to the CP.2 series, called CP.3 at NAB, April 2017. The new lenses use a cam follower focus system for lower focus torque and have reduced dimensions and a 95mm front diameter. The lenses can be optionally had with a electronic data system compatible with the Cooke protocol. As of 2017 the Zeiss CP.2 series is discontinued except for the CP.2 Super Speed and the CP.2 Macro.